Agenda for the ISD Board meeting to be held on 5 October 2017. Greetings from the ISD Board of Trustees. Our next Board meeting will be held on Thursday 5 October at 6.00 pm (refreshments served from 5.30 pm) in the Admin Conference Room. Parents of current students and faculty are welcome to attend as observers. This month, the Board will be looking at some proposed changes to wording of the School Policy. The proposed changes will be posted after the meeting until the November Board meeting for consideration and comment by parents and faculty, before the Board votes on whether or not to adopt them. Opportunity for non-Board member to address Board if requested prior to the meeting. And let’s not forget that as well as being the date for our next Board meeting, 5 October is the UNESCO International World Teacher’s Day! A big THANK YOU to all our ISD teachers who nurture our students here at ISD. Greetings from the ISD Board of Trustees. The Board held its first regular monthly meeting for this school year on 7 September 2017. The main focus of the evening was to confirm the draft goals that we had set at our Board Retreat. As is tradition, we also received our annual “State of Education” update from the Administration, so that Trustees are well aware of the way our students are achieving academically. The goals have been designed to address key governance issues for the school in the coming year. A Board Committee will be responsible for progressing each goal. If you have any questions or comments, you are welcome to contact the relevant Committee Chair via our email address boardbox@isd.sn. We are growing our International Baccalaureate Diploma Program, preparing to implement the Primary Years Program (in candidate status), and investigating whether the school should adopt the Middle Years Program. Through this Board goal, we will develop and implement a professional development program that facilitates the dissemination of key information that Trustees need to make informed strategic decisions on these and other school initiatives. The development of the Performing Arts Centre and Gymnasium is a significant investment for the school’s future. Construction will commence during this school year. Through this Board goal, we will ensure we undertake our governance role in the project successfully. This includes oversight over processes and finances to ensure that the Administration carries out the project in a compliant, transparent, and ethical manner. 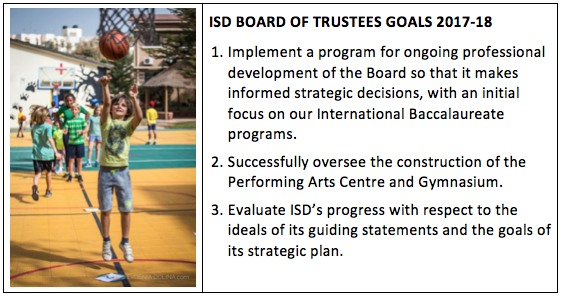 The Board is responsible for setting and monitoring the strategic direction of the school. We are now half way through our Five Year Strategic Plan. This Board goal sees us evaluating our progress against the Strategic Plan and also involves reflection the ways the school is living out the ideals in the guiding statements. At the Board meeting, Alan Knobloch also presented his Director’s Goals. Like the Board goals, these are linked to the Strategic Plan. The Director will explain his goals in his own Jag Journal post; however, I will note here that the Board voted to accept his goals for the year. We also settled and approved the members of our Committees for the year and approved our Governance Agreement. This document sets out the responsibilities of the Board as a whole and as individuals, the division of responsibility between the Board and the Administration, and procedures we agree to follow in our meetings. Using MAP test results, Alan Knobloch presented information about the way ISD students are performing, focusing on the changes in performance over time. He also shared some uplifting emails received from parents about their experiences of being part of the school community. Paul Lennon, IB Coordinator, provided the Board with a summary of the performance of the IB Diploma students and also the Grade 12 students who did not choose to complete the full IB Diploma (these students graduate with a US recognised High School Certificate). He also outlined the goals that have been set for the IB program looking ahead. The next meeting of the ISD Board of Trustees will be on Thursday 5 October at 6.00 pm (refreshments served from 5.30 pm) in the Administration Building Conference Room. Parents and faculty are welcome to attend as observers (it was great to welcome three parents at our September meeting). The Board can be contacted on boardbox@isd.sn. form committees to work towards achieving those goals. Teresa Arpin joined us to facilitate our three-day program. Teresa works with schools around the world to support good governance, strategic planning, and leadership. This is the second year that Teresa has facilitated our Board Retreat. Our governance training used hypothetical situations to prompt us to think about what the right action would be for a Board to take in different situations. Teresa guided us using a method called “generative discussion” to really speak openly about important issues that are before the Board at the moment. We also took time to get to know each other better and the ways we like to learn and contribute to the group. We developed draft Board goals for the year. I will share these with the ISD community in my Jag Journal article following our September Board meeting, once we have settled and voted on the final goals. We also formed committees, where the bulk of the Board’s work takes place. If you are interested in learning more about the committees and their work, please contact the Committee Chairs via our email address: boardbox@isd.sn. Our next Board meeting will be held in the ISD Administration Building Conference Room on Thursday 7 September 2017 at 6.00 pm (refreshments served at 5.30 pm). As always, parents and guardians of current ISD students, and faculty, are welcome to attend as observers. Questions and comments can be sent to the ISD Board email address: boardbox@isd.sn which is checked regularly by our Secretary, Jonathan Scott. We hope that you have had a great start to the school year and we look forward to serving you in the months ahead. Greetings from the ISD Board of Trustees. We hope all ISD families are enjoying these last few weeks of the 2016-2017 school year. The ISD Board held its last monthly meeting for the school year on 11 May 2017. Both our outgoing Trustees and those new Trustees elected at the Annual General Meeting were in attendance. Here are some highlights of the meeting. In this month’s educational update, Alan Knobloch gave a comprehensive overview of the recruitment process for attracting and employing teachers. The Board learned about how recruitment fairs work and strategies that ISD has put in place with the aim to attract the best teachers early in the recruitment rounds. We also watched the promotional film that senior film students produced a few years ago, which is used as part of our marketing – it was terrific! Both our US Ambassador’s Representative and Faculty Representatives will change in the new school year. The Board thanked Jenna Diallo and Sandra Goldsborough for their tremendous contributions to the Board. Jenna and Sandra then introduced the new representatives: Eric Davis, who is a lawyer with US AID and has a daughter Elena going into grade 5 next year is the new US Ambassador’s Representative. Catharina Wright-Guess, Middle School / High School English teacher is the new Faculty representative. These representatives are non-voting members of the Board and provide a value voice to Board discussions. The Board had a second reading of three policy items: the introduction of the Child Protection Policy, minor amendments to wording in the Harassment and Student Probation policies and minor wording amendments to the Obligations to Staff Policy. The Board voted unanimously to adopt these policies. The Board considered a proposal from the school administration to extend the Pre-K 4 program to a full day. The request came via Susan Kusiima, Admissions Coordinator (reporting strong parent demand for a full day program) and Elementary School Principal Kelly Chumrau (who explained the educational benefits of a full day program for Pre-K 4). The Board voted to adopt a full day program from 2017-2018 onwards, with an option for a half day in 2017-2018, recognising that there were current Pre-K 3 parents who enrolled their children this year on the understanding that the Pre-K 4 program was a half day. Suzanne Wardini, Assistant to the Director updated the Board on the progress to date and timeline for the PAC building project. Those interested in the details are encouraged to contact Suzanne. One component of the Board’s professional development and performance review, is an annual self-survey where we reflect on our strengths and areas for improvement. Secretary Marie Blanchard reported on the results of the survey, which help us to plan for next year. Treasurer Thiaba Camara Sy noted that the Board had previously undergone a process to select Ernst and Young as the school auditors for a period of 3 years. This is the third year of that tenure and the Board approved Ernst and Young as the auditor for the 2016-2017 year. The final meeting of the year is always tinged with sadness as we farewell those who are finishing their terms on the Board or leaving Dakar. 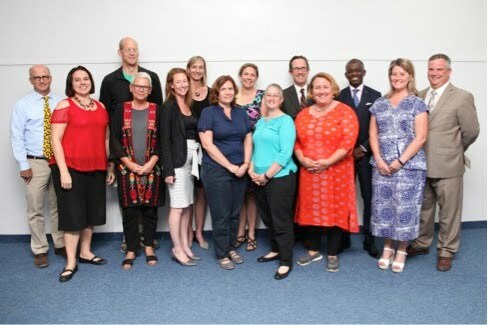 L – R: Brad Bell (Secondary School Principal), Sandra Goldsborough (Faculty Representative), James Garry (Trustee), Anja Sebunya (Board Assistant), Marie Blanchard (Secretary), Linda Percy (Vice-Chair), Jenna Diallo (US Ambassador’s Representative), Louisa Gibbs (Chair), Jennifer Grant (Trustee), Jonathan Scott (Trustee), Jennifer Burt Davis (Trustee), Pape Madiaw Ndiaye (Trustee), Kelly Chumrau (Elementary School Principal), Alan Knobloch (Director). Absent: Thiaba Camara Sy (Treasurer). Thank you to outgoing office bearers Linda Percy and Marie Blanchard, who have done a really tremendous job this year. The Board Finance and Buildings and Grounds committees will meet one more time before the end of school; however the next full meeting of the Board will take place at the Board Retreat from 24 – 26 August 2017. In this week’s Jag Journal, I would like to report on our recent AGM and Trustee elections, as well as letting you know about our next Monthly Board meeting to be held on 11 May. At the Annual General Meeting, ISD administration and Board reported on their work and goals this school year. It was also an opportunity for the school to recognize staff members from all areas of the school for their service to ISD. Elementary school Principal Kelly Chumrau presented 5, 10 and 15 year service awards to ISD staff and faculty members. Congratulations to all recipients! Brad Bell shared an overview of college acceptances obtained by ISD graduates over the past five years and by this year’s senior class. PTO Co-Chair Nelly Archibald and PTO volunteer Stephane Rosenberg provided an overview of the PTO’s varied activities during the year, from bingo nights to the soirée litteraire. Director Alan Knobloch shared success stories of some of our students and thanked ISD staff for their efforts over the course of the year. He also reviewed school finances and gave a preview of next year’s budget. Board Chair Louisa Gibbs explained the role of the Board of Trustees as ISD’s governing body and reported on the Board of Trustees’ regular activities and specific goals for this year. Key findings from the 2016 Parent and Student Satisfaction Surveys were shared by Board Trustee Jennifer Davis and Middle School Assistant Principal John Wishart. Questions from the floor were moderated by Board Trustee Jennifer Grant. Board Vice-Chair Linda Percy announced trustee election results at the end of the evening. The Board thanked Brad Bell, departing Secondary School Principal for his outstanding service to ISD and to the Board. Brad has been an active participant in Board deliberations for 5 years and we wish him the very best of luck in his new appointment as Director of the American School of Yaounde. Thank you to all the parents and faculty who shared in the evening. Thank you to ISD parent Evgenia Dolina for taking these photos of the AGM. Marie Blanchard, James Garry and Jonathan Scott continue to serve for the second year of their two year term. The new trustees are also joined by a new US Ambassador’s representative: Eric Davis, and Faculty representative: Catharina Guess-Wright. The Board thanks outgoing representatives Jenna Diallo and Sandra Goldsbourgh for their exceptional contributions to the school’s governance. As always, parents and faculty are invited to attend Board meetings as observers. The next meeting will take place on Thursday 11 May at 6.00 pm in the Conference Room in the Administration Building. Refreshments are served from 5.30 pm. If you would like to contact the Board, please write to us at boardbox@isd.sn. The flags along the fence line this week remind me just what a special international community we have here at ISD. Our Annual General Meeting will be held on Thursday 20 April and I encourage you all to come along (you will receive a special communication about this event). Before then, all parents / legal guardians of current students and faculty will be receiving an invitation to vote in the Trustee elections. We need 25% of you to vote in order to reach quorum, so I very much encourage you to have your say through this election process. We will also be participating in a number of meetings with the Accreditation Team that is visiting the school in late April, as part of the school’s periodic accreditation with Middle States Association and the Council of International Schools. However, first on our agenda is our regular April monthly board meeting. It will be held in the Conference Room in the Administration Building at 6.00 pm next Tuesday 11 April 2017, with refreshments served from 5.30 pm. You are welcome to attend as an observer – please see the agenda below. There has been a request from a parent to address the Board. There are no decision items. As always, you can contact the Board via our email address: boardbox@isd.sn. There’s lots to report from the ISD Board this week! First, a vote of thanks to all of you who have completed the parent survey. This has now closed and we will be analysing your comments and reporting to you on them at the AGM on Thursday 20 April. A thank you also to those parents who have nominated for the upcoming Trustee elections. The nominations have also closed. Soon you will receive information about each of the candidates and we will be asking you to vote electronically to elect Trustees to the vacant positions for 2017 – 2018. I urge you to vote when you receive the link – our constitutional documents require 25% of the ISD Association (parents and faculty) to vote electronically in the election or be present at the AGM. The Board also held its monthly meeting on Tuesday March 14, 2017. A highlight was the presentation by Marc Guillaume, Denrol Grayol and Hazel Ward, who are part of the teacher committee looking at the appropriateness of the International Baccalaureate Organisation’s Middle Years Program (“MYP”) for ISD. They presented on their analysis of the program so far and recommended that ISD does not apply for candidacy this year, but rather, makes some further enquiries and take some further preparatory steps that are likely to lead to a recommendation to pursue candidacy in the following year. 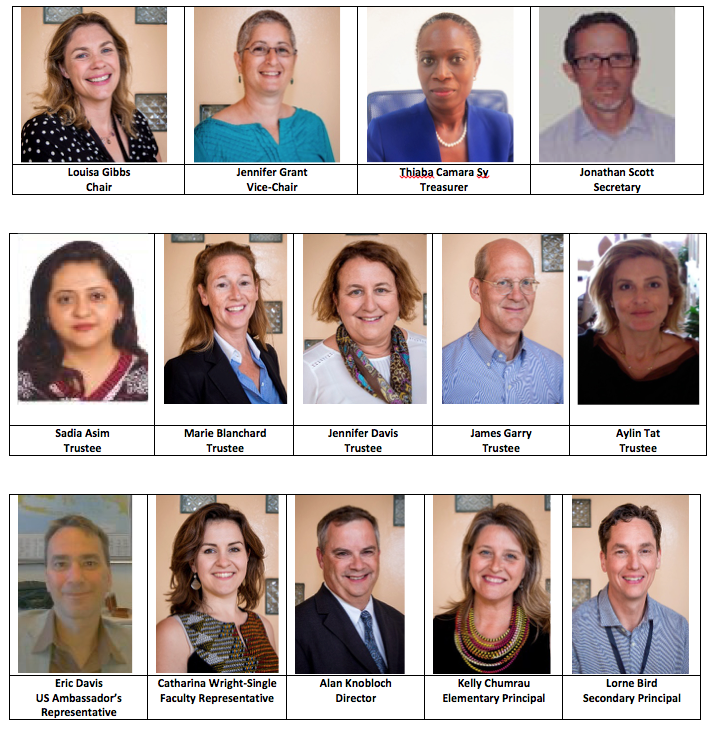 · amended the school’s fiscal year from 1 July to 30 June to 1 August to 31 July to align with the school academic year and international staff’s contracts. Looking forward, the Board is preparing for the AGM. We settled the agenda, which includes a really interesting mix of information on the Board’s and Directors’ progress against this year’s goals, celebration of staff milestones and the class of 2016’s college placements and a report back on what parents and students think of the school, taken from the recent surveys. The successful candidates in the Trustee elections will also be announced. All this with a drink and a nibble and a chance to catch up with other ISD families! Please remember that you can contact the board at boardbox@isd.sn and that parents of current students and faculty are welcome to attend all Board meetings as observers. Our next meeting will be held at 6.00 pm on Tuesday April 11, 2017 in the conference room, with refreshments served from 5.30 pm. First I would like to thank all those parents who have already completed the Parent Survey – this is your opportunity to provide us with feedback that we as a Board take very seriously in setting the strategic direction for the school. The school administrators also rely on it to know what the school is doing well, where it can improve and what the issues of importance are for our school community. A French translation of the questions is also available – if you need support, please contact boardbox@isd.sn. The survey remains open until Friday March 17, 2017. Registration is now open for candidates wishing to run in this year’s Trustee elections. There are 6 seats on the Board that will be contested this year. Being part of the Board is a great way to contribute to the life of the school and we are looking for Trustees with the talents and time to help in this governance role. If you are interested, please do let us know via boardbox@isd.sn and current Trustees would be very happy to talk with you about what is involved. To apply, you must submit your CV, photo and a short statement of intent to boardbox@isd.sn by Friday March 17, 2017. Please also put the date of our Annual General Meeting in your diaries now: Thursday April 20, 2017 6.30 – 8.30 pm. The AGM is always an enjoyable and informative evening for our community to get together, with reports from the school Director and the Board, information about where our graduating students have been accepted into university and celebrating service milestones of our staff. All this with a nibble and a glass of wine! Before our pause for Spring Break, I would like to notify you of the next meeting of the ISD Board. Parents of current students are always welcome to attend as observers. If you are thinking of running in the upcoming Trustee elections, please consider coming along to see how the Board operates and to meet current Trustees. The ISD Board of Trustees will hold its November monthly meeting on Tuesday, March 14, 2017 at 6.00pm, in the ISD Conference room (top floor, ISD Admin building). Refreshments are served at 5:30pm.